HOW QUICKLY you consume caffeine is JUST AS IMPORTANT as HOW MUCH caffeine you consume. Sipping your caffeine and even breaking the 1 can = 1 serving suggestion (treating 1 can = 4 servings) you can decrease the total amount of caffeine you consume in one day and ultimately teach your body to work just as well with slightly smaller doses. Mr. Thrift sips his caffeine throughout the day to make it last. Mr. Swift makes sure to drink every last drop of a 16 ounce can containing 160 mg caffeine on his way to work. By the end of his shift, he feels like he needs another can. 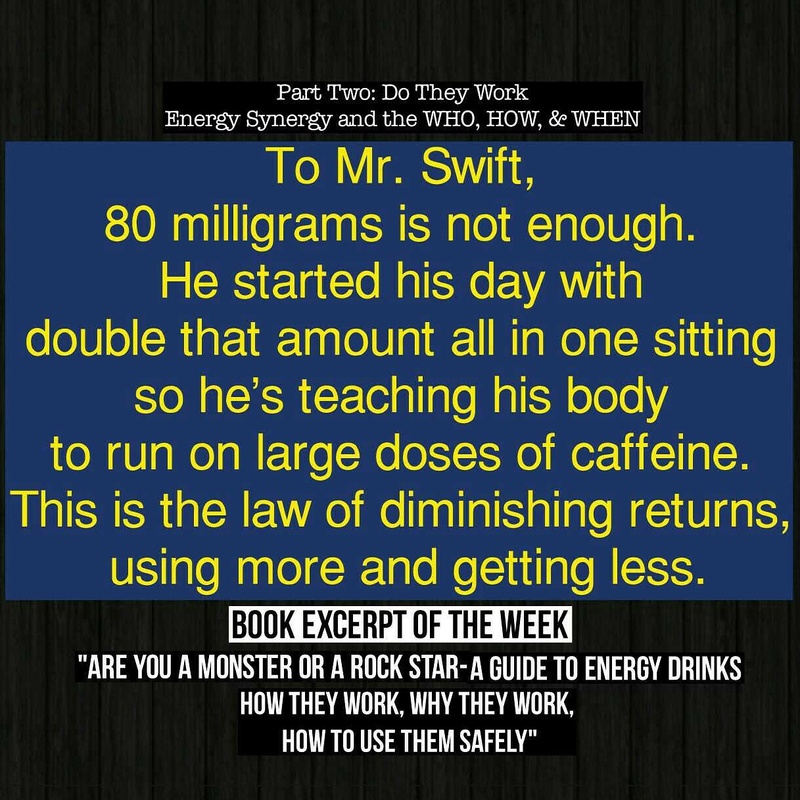 With caffeine’s half-life of ~4 hours, there is still ~80 mg in Mr. Swift’s system. However, with his consumption habits, this won’t feel like enough. When I was in grad school I would drink a full bottle of water, then pour half my energy drink in that empty bottle and save it for the next day. The carbonated energy drinks would lose all the carbonation overnight, but I didn’t care. The caffeine still worked. To this day, I rarely finish a whole energy drink in one day. Those days that I do, it’s a long drawn out consumption, to ensure I don’t consume more caffeine than I absolutely need. Get your copy of my book, “Are You a Monster or a Rock Star-A Guide to Energy Drinks: How They Work, Why They Work, How to Use Them Safely” on Amazon and wherever books are sold.